We have been doing a lot of banners lately, but I love the variety. Paper banners are such an easy way to add a festive accent piece to any party decor. And it is so fun to make them as cute as possible! 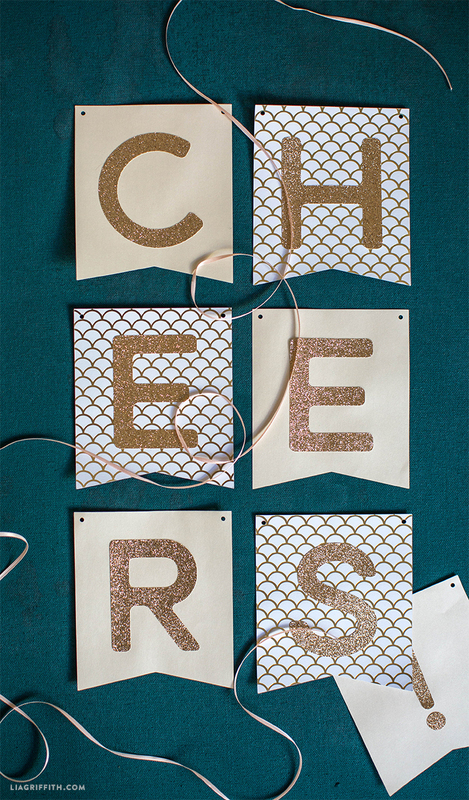 We shared our elegant Just Married papercut banner, our patterned baby shower banner, and now we are sharing our cheers banner. Our designer Krista (Queen of Cute!) originally created this design for her cousin’s upcoming bridal shower. Because we like to take inspiration from our everyday lives and experiences, of course we thought that we should share the design with our readers! The download below includes every letter of the alphabet, numbers 0-9, and the template for the flag shaped banner pieces. 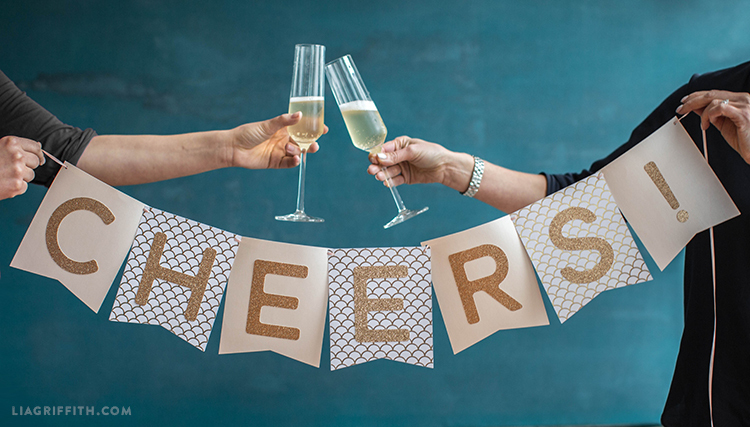 We love the idea of using a cheers banner for a bridal shower, but you can create any banner that you would like with these templates! To make our banner, we used a combination of card stock and text weight paper. We found a fun gold foil patterned card stock at our local craft store, as well as glittery gold card stock for our letters. 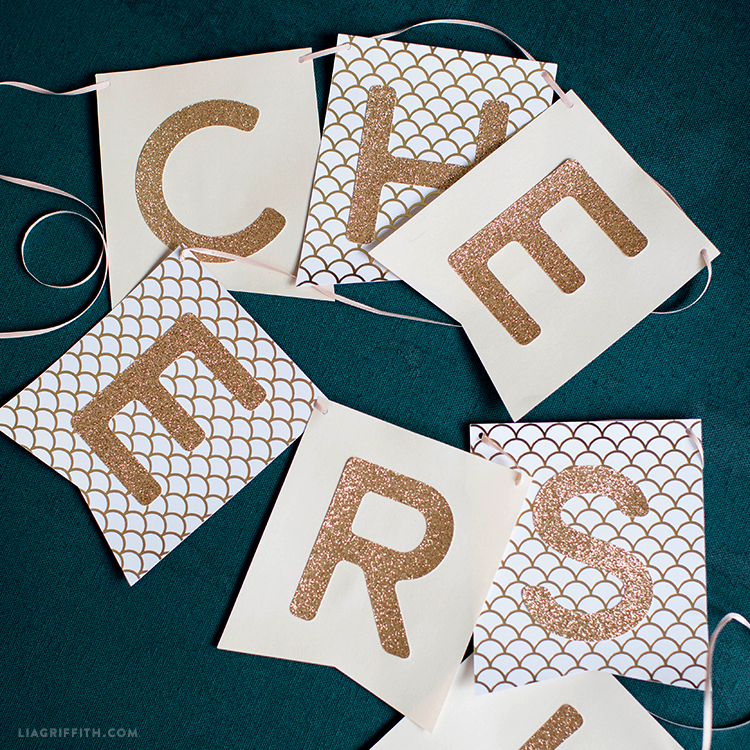 We then alternated the patterned card stock with a light coral text weight metallic paper from Paper-Papers to create the cheers message. Download the PDF template below if you are cutting by hand, or use the SVG file to upload directly to your cutting machine. After we had each of our pieces cut out, we used a glue dot roller to attach the letters to the papers. Next, use a small circle punch to create holes in the top corners of each piece of the banner. This will allow for you to easily string the cheers banner together. We used a pretty piece of blush colored ribbon, but you can also string the banner together with some twine. Can hardly wait to get gold foil and sparkly gold papers so can make this, so pretty. Did I miss something somewhere that made the scallop print on some of flags? Love this for all versatility it offers with letters and numbers. Thx so much for sharing. Think will order papers from papers-papers, not much luck finding right type of metallic papers in Grand Junction that are any good for project like this. Was very impressed with papers I received from Papers-Papers few months ago, worth it and received pretty quickly. Are you having at least really nice holiday weekend? Hope so. Enjoy and relax. Hi! We found the gold scallop print paper at Jo-Ann, and saw some other great options there too! I’m glad you like your order from Paper Papers, it’s definitely one of our favorite places to shop 🙂 We all had a nice weekend and hope you did, too!